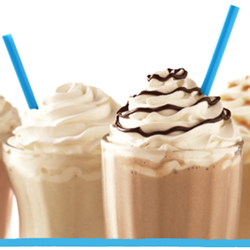 New Frozenta chocolate, white chocolate and caramel signature sauces complement the company's Polar Powder and Hot Chocolate Freeze blended drink mixes. Frozenta base mixes offer coffee shops and restaurants the flexibility to create a wide variety of frozen blended drinks from a single powder, while the signature sauces expand the range of oh-so-tasty beverage options. Made with premium ingredients, Frozenta Chocolate, White Chocolate and Caramel sauces help coffee shops and restaurants put together drinks that stand out in a crowded market. Frozenta is a wholesale distributor of versatile blended drink products to make frozen espresso, tea and hot chocolate drinks. Quality tested in hundreds of coffee shops across 36 states, the company’s all-in-one Polar Powder and Hot Chocolate Freeze base mixes offer coffee shops, cafés and restaurants the flexibility to create an unlimited variety of blended drink combinations from a single powder. Signature chocolate, caramel and white chocolate sauces complement the powders to produce an even wider range of oh-so-tasty offerings. We believe beverages should be enjoyable to drink and simple to make! To learn more, visit frozenta.com.